Did you all have the Barbie Dream House when you were younger? Of course you did! With all the accessories and the pink Corvette in the garage! 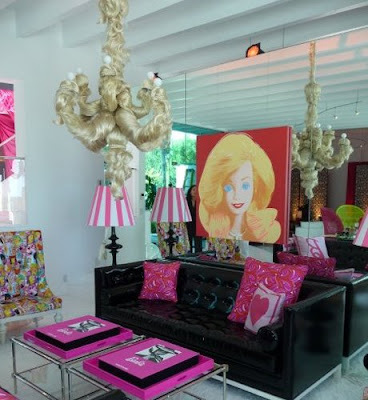 Have you ever thought what it would be like to actually live inside Barbie's mansion? Famed interior designer Jonathan Adler designed an actual Barbie Malibu Dream House to celebrate the icon's 50th birthday, complete with Barbie hair chandelier and pink Christian Louboutin-packed closet! Prepare yourself, we're on pink overload here today! 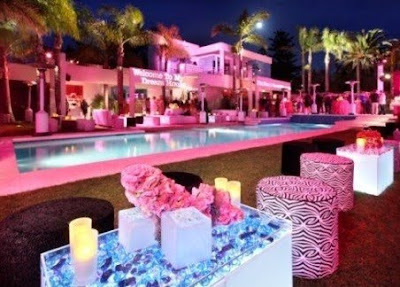 I think this would be such a fun place to entertain! Or have a sleepover?? 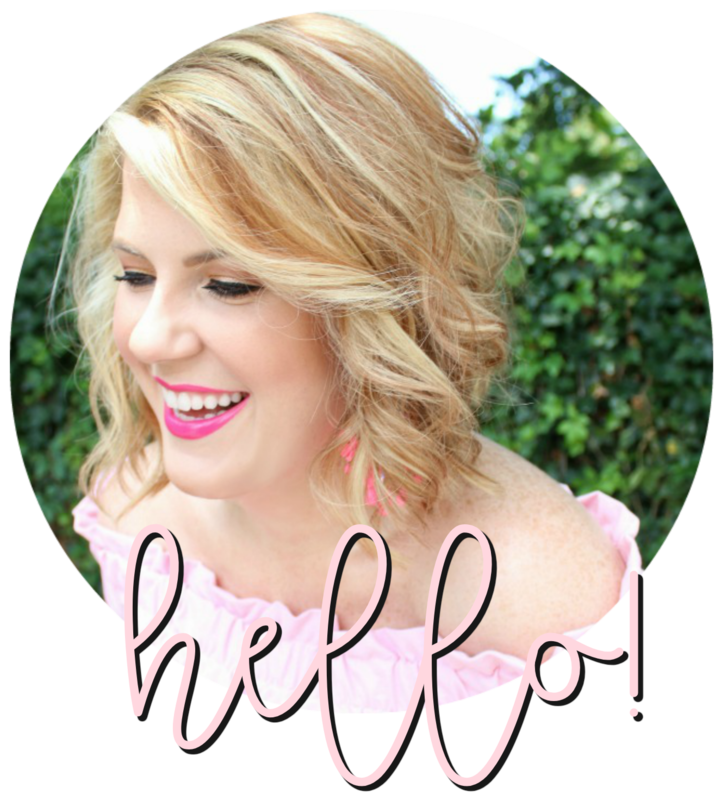 A bloggy sleepover?? I will leave you with a short video of Mr. Adler giving a tour of the house. It's definitely worth watching! With little facts thrown in along the way. I'm wishing you pink Louboutin smiles all day! That Barbie house is my dream home, LOVE it! I can't get enough of those pics! And yes, we had Barbie everything (well, not like, linens and stuff, but the toys part, yes), when we were little, I think my favorite was the giant 70s Dream Van, ahhhhh! Haha! I love it! 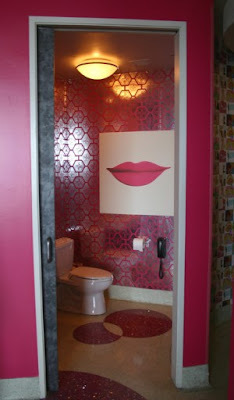 The hair chandelier is a bit freaky and unusual....but yes, a bloggy sleepover would be so fun there!! how fun!!! my girls would love it! i do to...except that hair chandelier that kinda freaks me out just a bit!! Wow, there's a lot of custom made things just for Barbie! I love it all and would certainly live in this space, if I could. Except I think I would take out that hair chandelier and the hair tassels on the lamps. That just seems wrong to me. My favorite was the bedroom. I know, y'all, isn't that hair chandelier the craziest thing ever?? I was so freaked out, but so intrigued at the same time! Wow! That is crazy and amazing. The hair chandeliers; however, are a bit weird. Glad you shared this! I love the Louboutin pink shoes!!! except the chandelier freaks me out a bit. 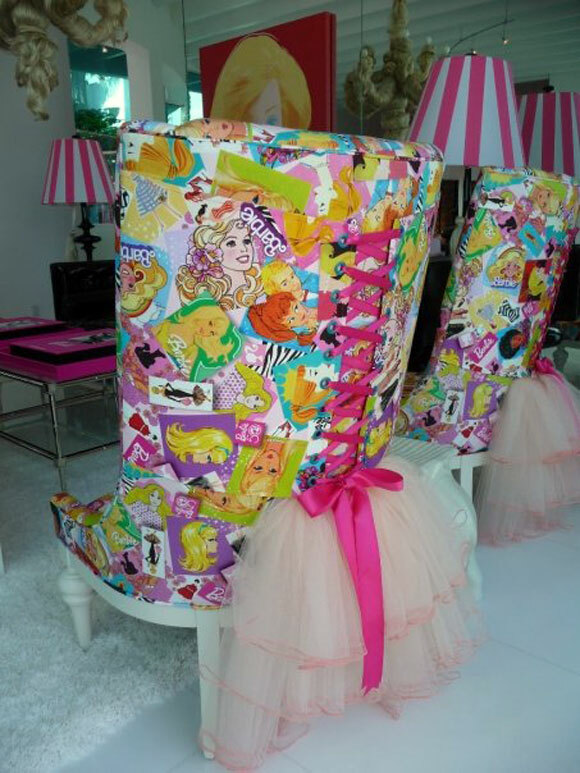 love the tutu's on the back of the chairs! I had a really cute dol hours, but these are to DIE for!!! That's just plain crazy! That guy's got some skills! That chandelier is straight freaky! Haha! 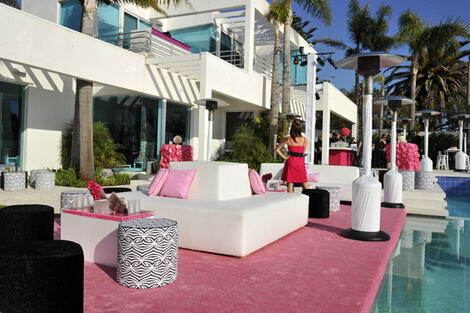 But the vanity & the pool area? YES, PLEASE! Great design...so clever with the Barbie theme. But the hair chandelier is a bit too much for me. Loved the bedroom and pool area!! ok, i was really into this, but that hair chandelier just crossed the line!! Umm, WOW! Holy pink Batman! I do love some of the design - especially the black and white - but WOW! Those rooms are CRAZY fun! Oh yeah a bloggy sleep over there would be a riot. It's so crazy and over the top. I love fun things. I am so ready to move in! I just love the pool area.